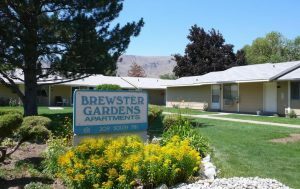 Thank you for visiting our website and learning more about Brewster Gardens Apartments. We are located at 309 South 7th Street in Brewster, Washington 98812. They say the grass is always greener on the other side, but if you ask us, the grass is pretty green here. It’s beautiful. Peaceful. Everything you need is here. Stop by Brewster Gardens Apartments to see for yourself. Click to learn more about our various types of apartments, and what each one offers. We have 1, 2, and 3 bedroom options. Brewster Gardens Apartments is in good condition, with ongoing updates and remodeling in various units and throughout the property. To learn more about pricing and availability for our units, please contact us today by calling (509) 689-3324 or emailing brewstergardens@hotmail.com. We look forward to serving you.